David Szafranski always makes us aware of "the cost.' So it was no surprise when the lime-green announcement for his current show at Gray Matters stated both its title and its theme: "Prepare to Pay.' There's something stern, moralizing, very '90s about its tone. The self-indulgent, excessive '80s are behind us, after all, and the piper is at hand, demanding payment. Isn't this what we have come to expect? What gallerygoers will not expect, however, is that Mr. Szafranski is serious about this payment business— to the tune of $2 a head. A sign outside the exhibition announces the fee, there's a roll of tickets and someone—often the artist himself—will take your money. A curtain hanging across the entrance to the exhibition space prohibits even a free peek. There's something brilliant in this gesture. At a time when visitors to art galleries are inured to the most outrageous images and are willing to accept just about any action as art, Mr. Szafranski has succeeded, with his $2 admission charge, in overstepping the bounds of decency. He has changed the rules. For several years, Mr. Szafranski has been showing sculptures and objects that speak of situations where the rules have changed—situations in which our assumptions make us play the fool. He's a showman who knows how to give the audience exactly what they want, but then he makes them feel guilty for wanting it. He has said that he likes to think he is leading the viewer into a trap. Bright, shining lights are his usual medium for leading us on. His most distinctive pieces have always resembled home lighting fixtures gone berserk. In the past, he has joined bulb after bulb to multiple, connecting sockets until the result resembled a malignant growth or an aggressive rod of blinding, circuit-breaking light. The light pieces in this show are of lower voltage than most of the previous work, and they play more directly off images of the traditional American home. The Cause of Crocodile Tears consists of two crystal chandeliers that have been reassembled into one, then upended and separated from their stems by a chrome pipe more than 10 feet long. The title implies that the piece is about falseness and putting on a show; but there is no denying that this still-functioning light remains bravely elegant despite the ridiculous position it finds itself in. Marvel Lighting Device brings the viewer several steps down the social ladder from the previous piece. The single bulb of a fake marble table lamp, which bears an unmistakable resemblance to a funeral urn, has been replaced by a more elaborate round of 10 low-wattage bug lights. These yellow bulbs alternately hang down or point up, which creates a nice rhythm to the piece but doesn't really distract from its distinctly low-class atmosphere. To add to the unpleasantness, Mr. Szafranski has hung uncoiled fly strips from several of the bulbs, and they have been doing their job. A small collection of insects and cat hair already adheres to their sticky surfaces. Lights designed to keep bugs away, tapes coated with a substance designed to lure them in—that combination of repulsion and attraction informs all of Mr. Szafranski's pieces. There are two "paintings' in this show. Quotation marks seem required because the artist admits that any serious painter would be disgusted by his methods. 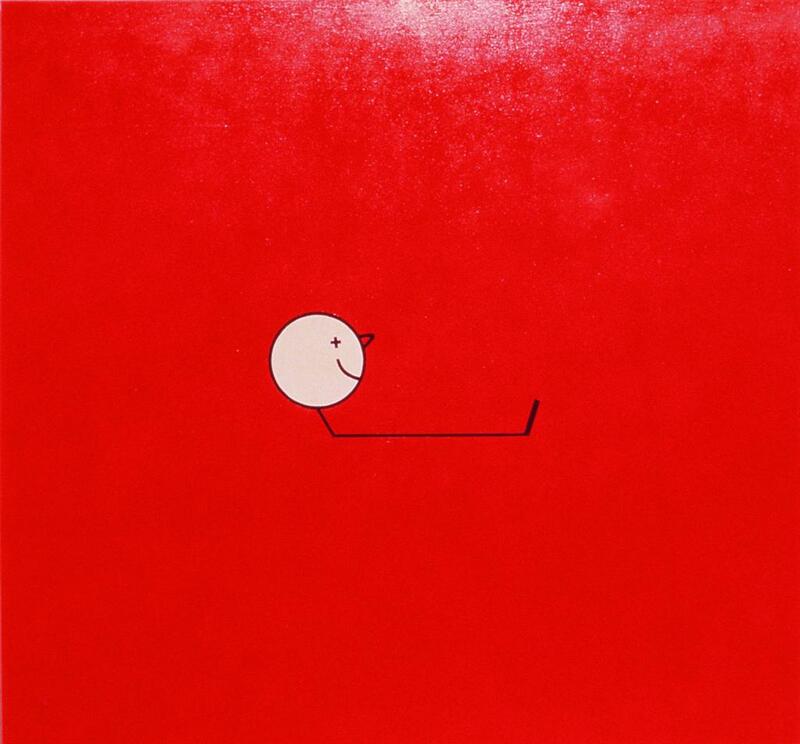 In The Great American Passout, Mr. Szafranski places the image of an obviously inebriated stick figure in the middle of a large canvas painted an eye-popping red. The subtle variations in the red surface are nothing more than the patterns created by the several cans of spray paint Mr. Szafranski used to cover the canvas. By coating the flat red spray paint with several layers of polyurethane sealant, he creates a dazzling, thoroughly tacky effect. Kills Rust! is another large, garish canvas, this one created by repeated washes of translucent red paint. Initially, it's difficult to see that a stenciled message fills the canvas, its letters composed of additional layers of paint. It reads "Private Property'—asserting not only the painting's ultimate status as a privileged commodity, but providing its future owners with a clear method of telling others to keep their hands off. These two paintings seem much more direct than the light sculptures, almost preachy. Other assemblages, however, involve layers of metaphor and materials as complex as anything the artist has created. 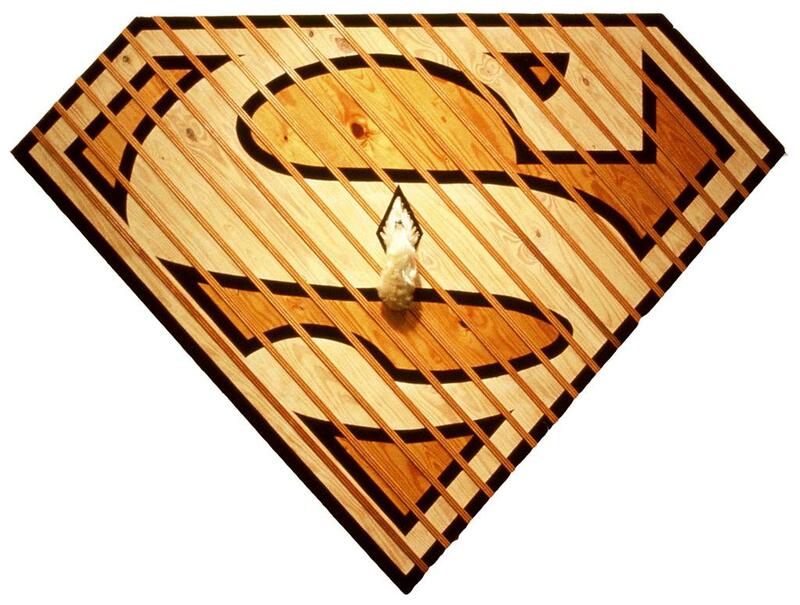 Man's Favorite Shape is a large replica of the diamond-shaped Superman logo done in knotty pine paneling. Few materials could so perfectly evoke the American home of the 1950s and, more specifically, Dad's part in it. Mr. Szafranski conflates this image of masculine domesticity with an evocation of the Man of Steel's brawny chest, then punctures the whole thing by sticking a perky blond ponytail right in the middle of the "S."
In addition to looking silly, the ponytail manages to make the whole thing seem unnatural. Since Mr. Szafranski lists anxiety as one of the emotions he wants his work to elicit, this piece must be considered an unqualified success. Mr. Szafranski has filled "Prepare to Pay' with objects that depict the slow decay of values he feels were largely hollow to begin with. This dry rot in the framework of American culture manifests itself most graphically in a small piece titled Snow Job. This vaguely house-shaped wall relief has been covered in several cans of the spray snow used to give that Christmasy feel to windows and store displays. When the artist first applies the snow, the result is fluffy and white, but almost immediately the stuff begins to yellow, contract in on itself, dry up and drop off. But not to worry. Throughout the run of the exhibition, Mr. Szafranski intends to replenish Snow Job periodically. No matter how much crusty trash mounts up on the floor, a few more cans of spray snow can keep the object pretty and white and absolutely false. Charles Dee Mitchell is a Dallas free-lance writer. Exhibit information "Prepare to Pay,' recent works by David Szafranski, is on view through March 28 at Gray Matters, 113 N. Haskell. Thursday-Saturday noon-5 p.m., or by appointment. For more information, call 824-7108. PHOTO(S): Man's Favorite Shape subverts the Superman logo with a ponytail.